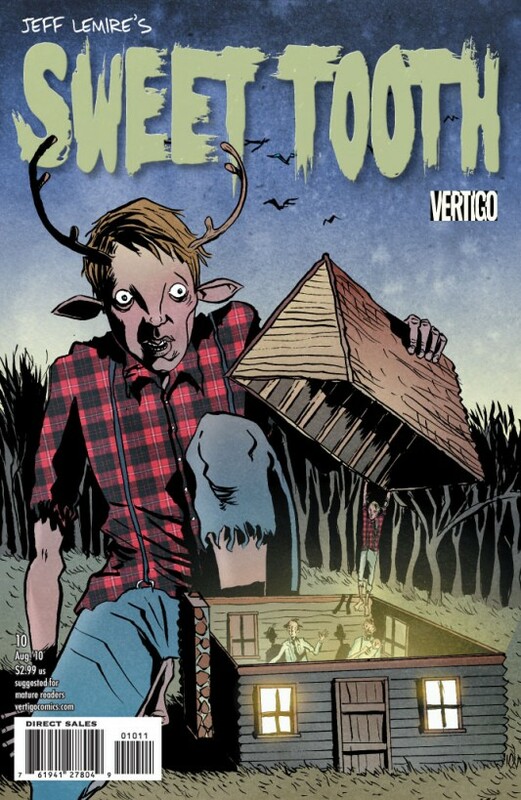 I am continually drawn into Jeff Lemire‘s genius mysteries for tons of reasons. One of those reasons is compelling characters as seen in previous issues of Sweet Tooth with Jeopard and also his series Essex County. Another big reason is the aforementioned mystery best seen in this issue, Sweet Tooth #10, and also his series The Nobody that gives me something rarely attempted in comics, a serious science fiction story. I have become captivated with all aspects of the story especially the mystery of Gus and this “infection.” How can you not feel for Jeopard and Gus at this point as well? I am rooting for both characters as well as hating these scientists for their cruelty. The problem with hating them though is not knowing how they got to where they are now, especially if they have to continuously watch people die and all they really want, from what we can see, is to cure this infection.